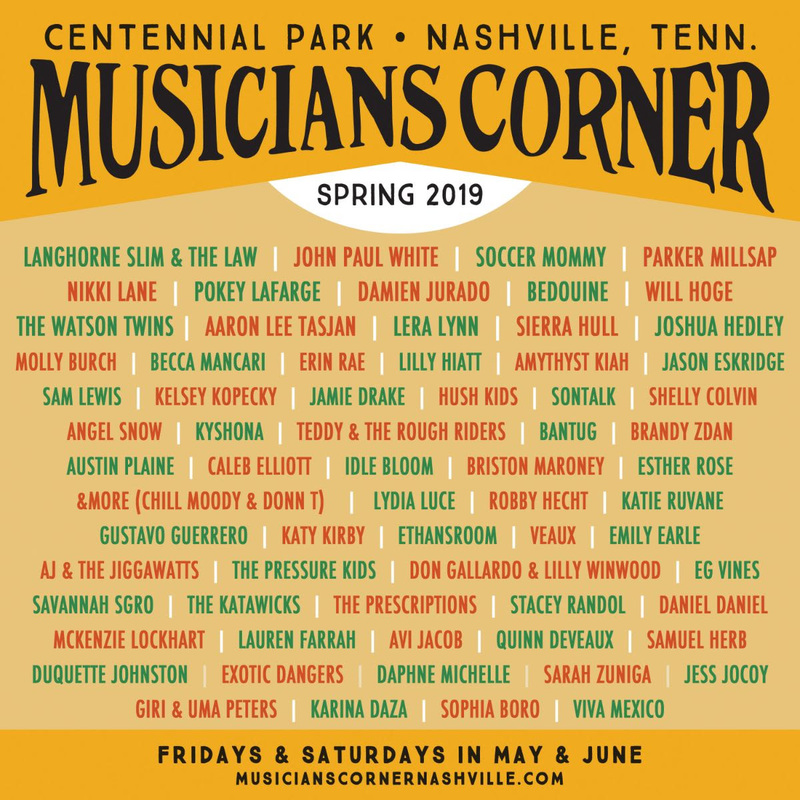 Musicians Corner will return to Centennial Park for its 10-year celebration with a two-day kickoff on Friday, May 10 and Saturday, May 11. The series provides free public access to live music and supports local and emerging artists. The 2019 Spring Lineup will include 22 events, taking place on Fridays and Saturdays in May and June. These inclusive events will feature multi-genre and multicultural musical performances on the Main Stage and Lightning 100 Acoustic Stage, food trucks, the Pub, local artisan vendors, Kidsville activities, and featured community partners. Events will take place from 5 – 9 p.m. on Fridays and from 12 – 6 p.m. on Saturdays. Musicians Corner’s May and June events will feature over 125 artists including boisterous folk troubadour Langhorne Slim & The Law, Grammy award-winning songwriter and former member of The Civil Wars, John Paul White, local indie rocker Soccer Mommy, roots rocker Parker Millsap, outlaw country singer Nikki Lane, American roots crooner Pokey LaFarge, moody Seattle songwriter Damien Jurado, Armenian folk singer Bedouine, local Americana hero Will Hoge, soulful indie-folk duo The Watson Twins, gritty folk rocker Aaron Lee Tasjan, former True Detective singer Lera Lynn, bluegrass songstress Sierra Hull, classic country champion Joshua Hedley, and many more. “Over the past decade, Musicians Corner has supported emerging artists, craft makers, and small businesses in addition to providing free music events for the Nashville community. Musicians Corner plays an important role in Nashville’s identity as Music City,” said Mayor David Briley. In addition to the general schedule, Musicians Corner will partner with the Nashville Symphony for the third year to present a performance by the Grammy award-winning Nashville Symphony orchestra in Centennial Park on Thursday, June 6. Musicians Corner will also partner with American Artisan Festival for a three-day event on June 14, 15, and 16 featuring high quality contemporary craft and fine art, and a lineup of local performers to be announced at a later date. “We’re excited to return to Centennial Park to celebrate ten years of free live music for the city of Nashville. The lineup features a great mix of some of our favorite artists who have performed on our stage over the years, as well as many new faces who we’re excited to showcase for the first time,” said Justin Braman, Musicians Corner Program Director. *The June 14, 15, 16 events will be held in partnership with the American Artisan Festival.